This pineapple cake is unique in several ways. First, there is absolutely no fat or oil in the cake itself (note: the frosting is another story). Second, it requires an entire can of crushed pineapple including the juice. This acidic juice interacts with the baking soda to make the cake rise. 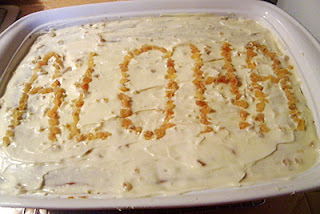 Lastly, I’ve already blogged several recipes from Cooking by Moonlight, my very favorite cookbook, so planned to just make this tropical-ish cake for a luau and not blog it. 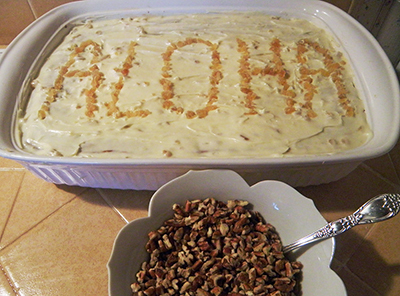 And then some lovely ladies at the luau wanted the recipe, and asked where to find it on Seasonal Eating. And so, by popular demand, here’s an easy cake that’s always a hit at parties. It’s important to allow enough time for the cake to cool completely before adding the frosting, which is mostly cream cheese and butter. Instead of being served on a platter, the cake is frosted and served in the baking pan, saving time and effort. 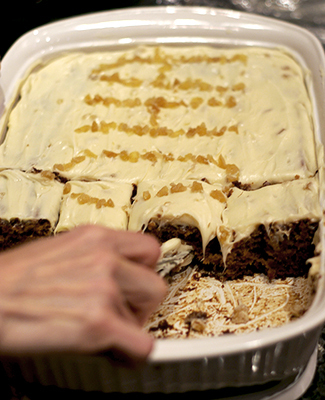 Use a baking pan with airtight cover to keep cake freshest. Chopped walnuts or pecans are a delicious component of the original recipe, but serve them on the side at potlucks to accommodate those with nut allergies. At no-nut-allergy birthday parties, cakes with 1 cup chopped pecans in the batter and a generous sprinkling of pecans to decorate the top have received rave reviews. The original recipe calls for 5 pieces of crystallized ginger, finely chopped, in the frosting. I use about 12 pieces, plus more for decoration, especially if I’m not sprinkling crushed pecans on the top. You can start with 5 pieces, mix it into the frosting, taste it, and keep mixing in chopped crystallized ginger until it’s just right. Or just go for the full amount in my adaptation. I have never heard a complaint about too much crystallized ginger. The cream cheese base mellows out the usual gingery sharpness. Note that this recipe calls for a 20 oz. can of crushed pineapple, and at this time organic pineapple is most readily available in a 14 oz. can. The smaller can will work, but the cake won’t rise as much in the center. 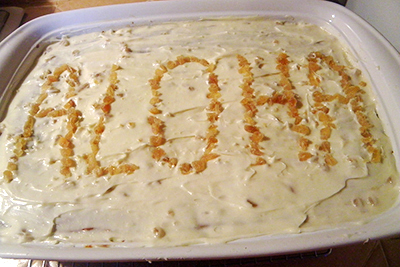 No one at the luau noticed, because I filled the “dip” with extra frosting. Next time I’d add a tablespoon of lemon juice (to interact with the baking soda), or a teaspoon of baking powder to make the middle rise more. I might also lower the heat to 325 degrees after putting the cake in, because the cake’s edges cooked much faster than the middle and got a bit too brown with the smaller amount of pineapple and liquid. Try this never-fail cake at your next party, and remember that any imperfections can be covered with frosting and decorations. Preheat oven to 350 degrees F. Butter a 13” x 9” baking pan. Beat eggs until light and fluffy in a large mixing bowl. Stir in pineapple, including juice, until well-mixed. 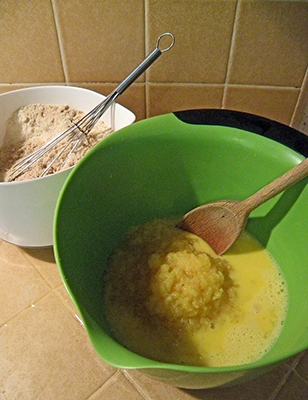 In medium bowl, whisk together flour, baking soda, granulated sugar, and brown sugar, until well blended and uniform. Stir flour mixture into egg mixture. Do not overmix. Fold in chopped pecans (optional). Turn out batter into prepared baking pan. Smooth evenly into pan with rubber spatula. Place on middle rack of oven. Bake for 45 – 50 minutes, until toothpick inserted in center comes out clean (check first at 40 minutes). If cake is getting too brown but is not done in the center, lower heat to 325 degrees and continue baking. vanilla, and beat until smooth. Gradually add the confectioner’s sugar: measure 1 cup and beat in thoroughly. Add second cup, and beat in well. Add another half cup and beat in, and so forth until desired consistency is achieved (I typically use 1½ cups total). Add ground ginger and beat until smooth and creamy. Sprinkle in chopped crystallized ginger by hand a few pieces at a time to avoid clumping. Use ¼ cup - ½ cup total, or to taste. Stir in until evenly distributed. 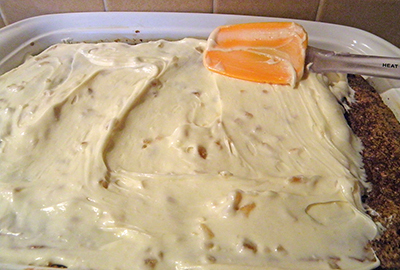 Spread frosting on cooled cake with rubber spatula. Decorate with additional chopped ginger and/or sprinkle with chopped nuts, if desired. I really can't wait to make this. I love how science-y you get with the recipe...my kids love mixing baking soda and vinegar. I was thinking this would be a great recipe to make with kids. I'd opt to let them take turns stirring the frosting while I kicked back (the only labor intensive part); I don't mind a bit of sugar spilling here & there...happens to me too...have fun!